Be it in front of Key West, in the middle of the Great Barrier Reef or in front of Scotland: in many of the world’s most beautiful dive sites, there are shipwrecks to be explored. Anyone who has ever dived along a shipwreck knows the fascinating atmosphere of such dives. The fact that wrecks exert such a great attraction is, however, also due to the underwater life surrounding them. Thus, innumerable sunken or deliberately sunk vessels serve as an artificial reef. 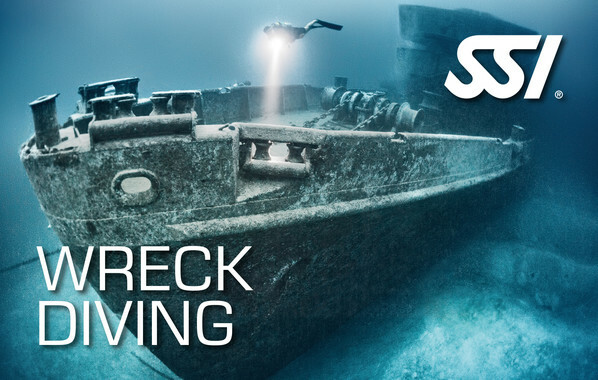 In order to be able to explore wrecks, however, a special certificate is necessary! You can acquire this with the SSI course “Wreck Diving”. In the course of the course, you will be given the necessary skills and skills to safely explore shipwrecks. You can of course complete the theory online via eLearning. Prerequisite for the course: You must already be an Open Water Diver! The minimum age for the Wreck Diving certificate is 10 years!